Our Shelter Helpers are life savers. Shelter Helpers represent the core of ARLGP volunteers. Rain, snow, or shine- our shelter helpers volunteer at least once a week in a variety of ways. Weekly volunteers are required to be at least 13 years old (volunteers between 13 and 16 must volunteer with a parent/guardian), commit to a regular volunteer schedule, and have health insurance. All applicants are required to attend an ARLGP New Volunteer Orientation and any necessary department training. Read our volunteer requirements and complete our online volunteer application form. Morning feeders help us to get everyone fed and watered before the day begins/ends. Since some of our guests are on restrictive diets, close attention to detail and organization are key to this role. Cat Caregivers help to make sure each cat environment is clean, safe, and comfortable for the day. This includes getting everything tidied up – bedding, litter pans, food, and well as general cleaning of the space before we open. This position is a wonderful chance to work with the cats, and morning caregivers get lots of love from our furry friends in the morning. Requirements: Must be able to bend frequently and carry light supplies. Afternoon Helpers keep our cats comfortable and the space looking nice for the public mid-day. This includes freshening water, feeding, cleaning litter pans, and checking to see what other areas may need some attention. Our felines depend on this routine every day to ensure a happy and healthy space. These volunteers deliver cats to our off-site adoption locations when they are in need of a new animal. The position required checking in with staff the day before to confirm that deliveries will be needed. Each 2 hour shift will typically include 1-3 deliveries, which could range as far as Windham. The job involves picking up the cat(s) and supplies at the shelter, delivering them to their off-site spot, and getting them set up in their new area with bedding, toys, food and water. As this is primarily an out-of-shelter position, we are looking for folks that are self-sufficient and motivated. As an ARLGP representative, you may also be asked to interface with staff of the local business get a sense of how the arrangement is working, so interpersonal and communication skills are a necessity. While this is a year-round position, higher demand is in the summer months. A valid drivers license, insurance and personal vehicle are required. Are you great with customer service, and have an out-going personality? Our feline area Greeters welcome guests, orient them to the space, and connect them with an Adoption Counselor when questions arise. Greeters also keep an eye on the multi-cat rooms, and find ways to kindly and tactfully intervene when needed (children climbing furniture, a visitor causing an animal stress). Good people skills, patience with children, a positive demeanor, and the ability to be flexible in a sometimes fast-paced environment. Additional duties may include light cleaning during quiet times. Each morning and afternoon, our dogs get outside for some much needed exercise and fresh air. Walkers also enforce good behavior while out on walks by using techniques that help to make our dogs more adoptable. Volunteers will work with dogs of all breeds and sizes. Each day R&R volunteers spend quiet time with the dogs in their kennels reading, talking, and providing extra love. This low-arousal interaction helps lower stress levels and teaches the dogs that they do not need to become excited each time a person approaches the kennel. This important training is key to the adoption process, and helps ensure success in their new home! Each morning our Kennel Cleaners work hard to give each kennel thorough cleaning to ensure that our canine friends have a clean and healthy space for the day. After each kennel is clean, we get it set up with fresh blankets and toys for each dog to return home to after their morning walk. Clinic Assistants assist the veterinary team with prepping for surgery, clinic procedures, nursing care and clean up. Volunteers for this position should have previous experience in a medical or laboratory field and be able to make a weekly, long-term (1 year+) commitment. Attention to detail and high cleanliness standards are a must. Experience with correct animal restraint methods and medications a plus. Requirements: 18 years of age, and able to lift 50-80lbs. Morning Caregivers assist with getting our critters (bunnies, guinea pigs, rats), ready for the day by cleaning, providing fresh bedding, watering and feeding. Afterward, Caregivers can socialize with the small animals and provide enrichment. Socializers provide enrichment and play time with the critters, and tidy up/feed as needed throughout the day. 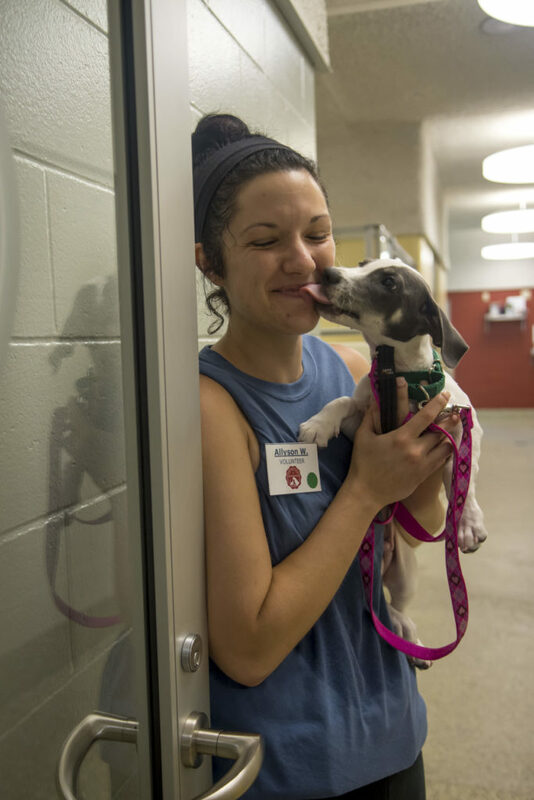 These are some of the most rewarding jobs at the shelter, as the critters often have a longer length of stay than dogs and cats, and weekly volunteers forge bonds with these wonderful guests. Preference given to people with small animal experience. We do 600 pounds of laundry each day! Each morning, all of our animals get clean bedding and toys to ensure they have a healthy and comfortable living space, plus we freshen their bedding throughout the day. Laundry volunteers are an integral part of our volunteer team, and you will be the favorite of all the staff! Keeping all of the shelter’s animal food and supplies organized, labeled, and stored efficiently is essential to our day to day operations. If you are well-organized and love keeping things that way, please consider this volunteer opportunity. You will become a master at navigating the shelter and will be a favorite among the staff and your fellow volunteers! Are you great with customer service, and have an out-going personality? Our greeters welcome and direct guests upon entrance, process/thank guests for donations, and help to manage lines during busy times. Customer service is a top priority, and we are looking for friendly and positive volunteers who can be flexible in a sometimes fast-paced environment. Other duties include: creating kitty-go-home-kits for our gift shop, general tidying of the lobby, and other areas as needed. Are you a stickler for detail who gets satisfaction out of keeping things clean and bright? It takes a lot of hands to keep this shelter clean and smelling fresh! Clean team members help us with this big task emptying trash cans, cleaning glass, sweeping, mopping, and dusting. Clean Team volunteers contribute to maintaining a happy and healthy shelter for our animals and staff. Requirements: This position can be quite physical, and involves lifting and bending. Administrative volunteers assist with the day-to-day tasks that happen behind the scenes. Daily needs change, but might entail: website work, scanning, assembling mailings, writing thank you notes, data entry and compiling adoption materials. Computer know-how is a plus, but not required. This is a great opportunity to get administrative experience in a working office. This position supports the Foster Coordinator to ensure that the Foster Program runs smoothly and successfully. This will include contacting our foster families (usually by phone) to check in, make surgery reminder calls and schedule booster appointments, as well as preparing & organizing foster orientation materials. This position supports our Transport and Foster Coordinators in getting our Transport pups ready and off into their foster homes. We are looking for a detail oriented volunteer to greet our foster families when they arrive, assist them in completing and reviewing the necessary paperwork, and to review supplies as well as any other relevant information. Are you great with customer service, attention to detail, and have an out-going personality? This position assists with the check-in process for our public spay-neuter program. The ability to be patient and empathetic, as well as deal with sensitive information in a confidential manner is a must. Do you have an interest in education and working with kids? We need enthusiastic people who are willing to lead small group tours and assist with lessons in the community. This may involve writing curriculum, preparing materials, working with local students & summer camp counseling. Requirements: Comfortable around all types of animals, with public speaking, and an interest in working with children. We are always busy with special events, fundraisers, and community appearances. We are always looking for volunteers who enjoy getting out in the community and supporting us at events, who have experience with development, outreach and community engagement. Once a week we take an adoptable animal to our local retirement and assisted-living communities. Our animals love the field trips, and the residents enjoy the special company. It’s a win-win for all. The ARLGP provides donation containers to generous businesses and shops in the community. Our volunteer collectors make a monthly visit to canister locations to pick-up donations and to thank the business. *Do you have a local business and are interested in hosting an ARLGP donation canister? Email sjohnson@arlgp.org for more information!